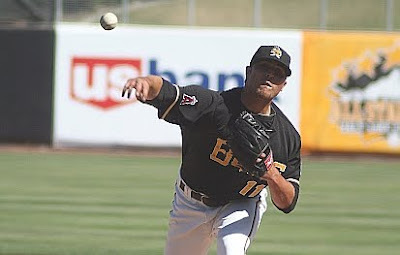 While recently in Salt Lake, I had the chance to catch a Triple-A game for the Salt Lake Bees. The game was nearly sold out as the Famous San Diego Chicken was there, and kids were enjoying his antics between the innings. Again I had a chance to talk with several scouts from different organizations to get their take on the Angels’ players. Located in an older part of Salt Lake, the stadium is very freeway accessible from the I-15 (near the I-80 if you are coming from that direction). While normally parking across the street is not a problem, the game was nearly sold out, and so parking was a bit more difficult. Still, there were enough public parking spots even 15 minutes before the game. Parking was $6 per car. The stadium has a seating capacity of 15,500. Ticket prices range from $5 to $23 per seat, with some games having surcharges for fireworks. For the money, the $15 Home Plate seats are the best deal in the house, although there really aren’t any bad seats in the stadium. The stadium has a beautiful view of the Wasatch Mountains in the background, which gives it a feel of the old Oakland stadium, before Mt. Davis was built. The stadium provided a wide variety of food ranging from hot dogs (the chili-dog looked good, skip the polish hot dog) to pizza, to Mexican fare. Prices were generally about 25%-33% less than similar fare in Anaheim. In the past I’ve partaken of the burritos and enjoyed it, so that is always a good pick. As with the stadium in Orem, Spring Mobile Ballpark is very kid friendly. There are picnic areas on the grass out in the outfield and lots of activities for kids to do such as a bouncy-house and a playground. There also was an 8-passenger train running in the length of the outfield that kids enjoyed. What was nice to see, both in the stadium, and around Salt Lake City (and even Park City, Utah for that matter) were all the Angels hats and shirts in the crowd. I saw more Angels gear in Utah than I saw for any other team besides either the Bees or Owlz. The normal mascot for Salt Lake, Bumble, is normally a kid magnet. Bumble Bee is very friendly, willing to sign autographs, pose for pictures, etc. However, the night I went, the Famous San Diego chicken was there to add to the antics. I have to give credit to him. At the end of the game, the PA announcer said that the Famous San Diego Chicken would stay to sign autographs and pose for pictures for all the fans. The line instantly became hundreds deep, and he stayed to sign for hours after the game to take care of all of his fans. Class act. First off, I didn’t get a chance to see everyone on the team play. The Bees played Sacramento (Oakland). And, unlike Orem, I didn’t get to talk to any of the players from the team. However, I did talk with several scouts who were there from both NL and AL teams. As most Angels fans know, the upper levels of our system are not overly stocked with high-profile talent. While that is changing at Double-A Arkansas with the promotion of Chatwood and Amarista, Triple-A has been considered a wasteland. That impression, though, is not entirely accurate. There are four notable exceptions to that list, and the scouts with whom I spoke had good things to say about them. We didn’t have as much time to talk as we did in Orem (between my family, the Famous San Diego Chicken, and the large crowd it was difficult) but here are the notes I have for those players. Peter Bourjos (CF): Dynamic game-changing speed with improved plate discipline. He’s become a true base stealer—he’s getting better jumps and picking better spots to steal. After getting a single, the pitcher threw over to first base several times. When the pitcher finally went to the plate, Bourjos stole second. On the next pitch, Bourjos stole third. The catcher and third baseman were rushed and the ball got away from the third baseman (although Bourjos beat the throw) and nearly scored. He ultimately scored on the next pitch on a groundout by Izturis (who was still limping while running and nowhere near as fast out of the box as before—all the scouts commented on that. The Angels may say he’s 100%, but he’s not. He was thrown out trying to steal second.). One scout said that Bourjos is “getting better.” They all agreed that he could provide gold glove defense, but, weren’t sure if he could hit enough to be a regular Major Leaguer (but no one questioned him as a 4th outfielder) and one speculated on whether or not he would walk enough to leadoff and take advantage of his speed. They all agreed that he needed more seasoning. One thing to note about Bourjos—he hustles. If fans want to know why he has more triples than doubles, it’s because he flies around the bases. On a routine fly to centerfield, he was within 2 steps of second when the catch was made. Had the ball been dropped, he would have easily been on his way to third. One thing that was nice to see with Bourjos—the old scouting report on him didn’t work. In the past, when Bourjos fell behind, the opposition could get him out with breaking balls off the plate. When I saw him, he laid off some breaking balls in those counts and fought off some good pitches to battle in his at-bats. Hank Conger (C): Two scouts said this about Conger “he’d be my starting catcher in the Majors right now” meaning that the scouts would take Conger over their current starting catcher in the Majors. Another scout said “he’s ready.” They all talked about his improved bat, but one also talked about his improved defense saying “what he needs to learn right now has to come in the ML.” I can’t comment on his defense because the night I saw him he was the team’s DH. Although Conger went 0 for 4 when I saw him, the one strikeout he had was on a bad call. Conger took an inside pitch that should have been a ball, but, he didn’t get the call. Still, he looked much more patient at the plate, and his nearly 1:1 K:BB ratio demonstrates the improved patience. Michael Kohn (RP): I didn’t see him play, but discussed him with the scouts. One scout said that he has “really good stuff, but can hang some fat pitches.” Most of the time he throws strikes, but, Kohn needs to work on tightening up his breaking stuff. The scouts discussed whether Kohn would be an 8th inning setup guy or a closer. There was a split decision on that, but all of them liked his composure on the mound. Either way, he should be a fixture in the back end of our bullpen. Mark Trumbo (1B/RF): Trumbo looked more confident at the plate then I have ever seen him. He walked twice on the night, taking some good pitches and laying off some bad ones. One scout said “He’s only getting better.” While this was the same comment that the scout said about Bourjos, the connotation and emphasis was different. With Trumbo, it was more to the point that he was heating up and adjusting to the league. Looking at his stats, his strikeouts per month are going down and his walks are going up. He’s on pace to set a career high in walks this year and a career high in on-base percentage. The scouts talked about his slumps being shorter this year than in the past. I asked the scouts about Trumbo’s defense in the outfield. One scout said “whatever it takes to get that bat to play.” Trumbo handled all the plays at first base well, but, by and large, he only had routine plays to make. His footwork appeared to be better, but, I didn’t see him have to make too many tricky picks in the dirt or difficult throws to make. It’s always great when AngelsWin.com can get scouting reports and updates from Eddie Bane and Abe Flores. We match those up with our own observations when making our Top-50 Prospect Lists. But, it’s even better when we can get scouting reports and comments from other team scouts to compare the notes. While the talent at Triple-A Salt Lake isn’t as extensive other levels in the organization, it’s not devoid of talent. There are some bright spots that can make an impact on the Angels in the near future, with more help coming from below.